For years, fat was a dirty word in the dietary world. After World War II, large studies established links between saturated fat and heart disease. Most dietary experts advised people to reduce their fat intake, not only because of the heart connection, but also because fat has more calories per gram than protein or carbohydrate and was assumed to contribute more to weight gain. Many people did so, but they often replaced the lost calories with large amounts of carbohydrates— especially refined carbohydrates. They also stopped eating healthy fats, like olive and canola oils. Instead of helping us slim down, the decline in fat consumption was accompanied by higher rates of overweight and obesity. What went awry? As it turns out, the "all fat is bad" message was wrong. Foods that contain fat help fill you up, so you stop eating earlier. More important, not all fats are alike. Saturated fat, found mainly in meat and dairy foods, contributes to clogged arteries and cardiovascular disease. But monounsaturated and polyunsaturated fats, found in plants and healthful oils, actually protect your health by improving your cholesterol profile. Fat has little direct effect on blood sugar levels. It is a major energy source for your body, and it helps you absorb certain vitamins and nutrients. 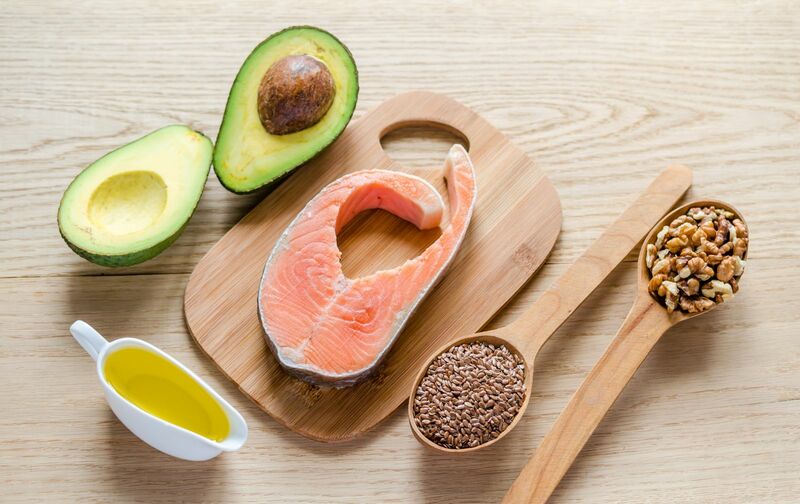 Another type of fat needed for a variety of vital physiological functions is the family of omega-3 unsaturated fats. Your body can't make these on its own; it must get them from food. Good sources of omega-3s include fatty fish such as salmon, tuna, sardines, and mackerel. Flaxseeds, walnuts, wheat germ, canola oil, unhydrogenated soybean oil, and flaxseed oil are also rich in omega-3s. Trans fats are the worst fats for your health. These fats are made when hydrogen is added to healthy unsaturated fats to solidify them and make them less likely to spoil. Trans fats raise harmful LDL cholesterol, lower beneficial HDL cholesterol, increase inflammation, and make blood more likely to clot. The FDA has ruled that "partially hydrogenated" oils, the main source of trans fats in the American food supply, are no longer "generally recognized as safe." By now, most food companies have stopped using them. But to be sure, look for products that have a zero on the "trans fat" line in the Nutrition Facts box. To learn more about the role of diet in your overall health, get a copy of Healthy Eating for Type 2 Diabetes, a Special Health Report from Harvard Medical School.